Stephen Joseph Harper (born April 30, 1959) was the 22nd Prime Minister of Canada from 2006 to 2015. He is a member and the former leader of the Conservative Party. He was elected in February 2006 and replaced Paul Martin as Prime Minister. Harper was born in 1959 in Toronto, Ontario and lives in Calgary, Alberta. He is married to Laureen Teskey and has two children. He is the third Prime Minister, after Pierre Trudeau and John Turner, to send their children to Rockcliffe Park Public School, in Ottawa. 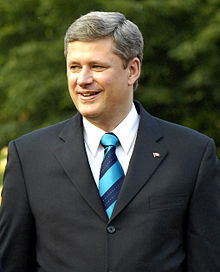 Stephen Harper was Prime Minister for nine years, during which Canada hosted both the Vancouver 2010 Olympics and Paralympic Winter Games. Harper also hosted the G8 and G20 meetings. Harper is a conservative and supports cutting government spending and taxes. As prime minister, he has cut the goods and services tax and approved a budget that would cut funding to several government programs. He has also shown support for the military and a bigger Canadian military presence in the northern part of Canada. Though Harper did win the seat in the Calgary-Heritage riding during the October 19, 2015 federal election, the Conservative Party was defeated by the Liberal Party of Canada, which was led by Justin Trudeau and who succeeded Harper as Prime Minister. It was thereafter announced Harper would resign as party leader and had requested an interim leader be chosen to serve until a leadership election can be held. ↑ "Conservative leader Stephen Harper wins Calgary Heritage riding". Global News. Global News. Retrieved 2015-10-20. ↑ "Liberals projected to win majority". Toronto Star. October 19, 2015. Retrieved October 19, 2015. ↑ "Justin Trudeau to be prime minister as Liberals surge to majority". CBC News. October 19, 2015. Retrieved October 19, 2015. ↑ "Stephen Harper resigns as Conservative leader". CTV News. October 19, 2015. Retrieved October 19, 2015. This page was last changed on 22 April 2019, at 17:29.